Dr. Bruce Mazie was raised in Wayne, New Jersey. He graduated with honors from the University of Virginia from in 1981. 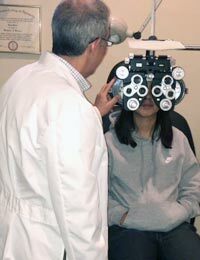 While attending the Pennsylvania College of Optometry in Philadelphia, Pa., he externed under some of the top contact lens specialists in the country. He also studied at Sheba Eye Institute in Tel Hashomer, Israel. After receiving his Masters in Visual Science and Doctor of Optometry, he opened his practice in his hometown in 1987. He is a member of both the American Optometric Association and the New Jersey Society of Optometric Physicians. Skiing, golf, music, and travel are some of his passions. He is married and has two children.